In a move that clearly states their intention to compete with Apple’s iPad, Research In Motion (RIM) have announced the pricing for their Playbook Tablet. The Playbook will go on sale in the US during the first quarter of 2011 priced at $499, exactly the same as the entry level iPad. Global sales will follow in quarter 2, 2011. Running a version of the QNX embedded operating system, the 7 inch touchscreen device will ship with a larger feature set than the iPad, albiet with a smaller screen. The Playbook will have more comprehensive connectivity options, shipping with both micro USB and micro HDMI connectors and it will also ship with front and rear facing cameras, a feature lacking from Apple’s industry dominating iPad. As with everyone releasing iPad competitors, RIM are also emphasizing their support for Adobe Flash a technology not currently supported by the iPad, something that could change soon as The Next Web have already reported. RIM have also announced that there are 3G and 4G versions of the Playbook in the pipeline but have not provided any further details of when they will be available or their prices. 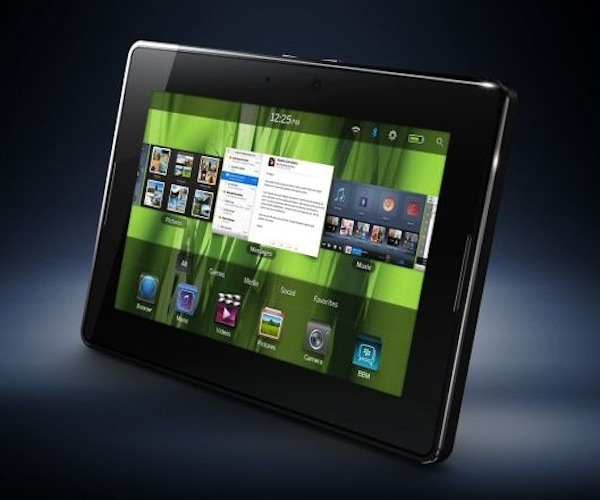 The RIM Playbook will not be the only entry into the tablet market in the coming months. Samsung’s Android based Galaxy tablet is already available in many areas and new tablets from Hewlett-Packard, Motorola and Dell are all said to be on the way.